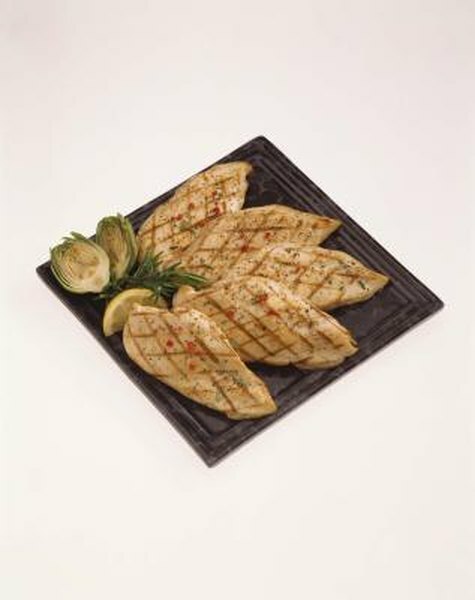 Chicken breast meat adds protein, vitamins and minerals to your diet. It also adds fat, with the amount depending on whether you consume the skin in addition to the meat. A large skinless breast weighing between 6 and 7 ounces contributes about 300 calories to your diet, while keeping the skin on increases the calorie count to approximately 400. Consult a dietitian with specific concerns regarding the nutrition in one large chicken breast. Protein is abundant in chicken, with a large breast providing more than 50 grams without the skin and nearly 60 grams with the skin, both of which is more than the 46 grams women need each day. Protein is vital to your nutrition because of the amino acids it contains, and the protein in a chicken breast supplies you with the full complement of essential amino acids you need in your diet each day. These essential amino acids are ones your body cannot synthesize, and you need them to build muscle, repair tissue, create blood cells and support your immune system. When other fuel sources are scarce, your body can also burn the protein from the chicken breast you consume for the energy it contains. Fat is another critical component of your diet, providing energy, enabling you to absorb fat-soluble vitamins, cushioning your organs and providing the building blocks for healthy cell membranes. Much of the fat in a large chicken breast resides in the skin, with 15 grams of total fat in a large breast compared to 6 grams when you remove the skin. A significant proportion of the fat in both breast meat and skin is saturated fat, an unhealthy type of dietary fat that is solid at room temperature. High intake of saturated fat is associated with an increased risk for cardiovascular disorders. A large chicken breast also contributes roughly 150 milligrams of cholesterol to your diet. The presence of skin on a chicken breast has little effect on its vitamin content. A large breast is rich in the B vitamin niacin, providing 1.5 times your recommended daily intake. It also supplies you with 75 percent of your daily requirement for vitamin B-6, 30 percent of your pantothenic acid and 25 percent of your vitamin B-12, as well as 15 percent of the riboflavin and 10 percent of the thiamin you need each day. A large chicken breast contributes more than half your daily requirement for phosphorus. It is also rich in zinc, supplying roughly 20 percent of the amount you need every day. A large breast is also a good source of iron, contributing roughly 10 percent of your recommended daily intake. In addition, it provides you with approximately 10 percent of both the magnesium and potassium you require daily. In general, a large chicken breast with skin contributes a slightly higher mineral content to your diet than chicken consumed without skin.